If you’re a fan of puzzle games, then you’re probably also a fan of the App Store – it has brought us an incredible amount of great puzzle games. And Burn it All, one of the newest entries of the genre, keeps the fun going with a simple idea that was translated into a charming iPhone and iPad game. And the idea really is simple: You will have to burn down ropes, pieces of wood and bats (mean, isn’t it? ), by dragging a flaming lava rock onto them. If done in the right order, all the ropes will have burned down within the levels’ time limit. That’s it. 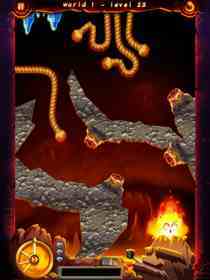 But the task will get more complicated as the game gradually introduces new types of ropes, obstacles and lava rocks. 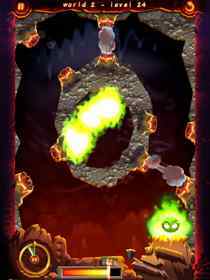 Later on in the game you will have to evade water drops that instantly cool down your flame and you will have to deal with with ropes that burn slower or faster than the usual one. Depending on how fast you can clear the level, you will be rewarded with up to 3 diamonds. 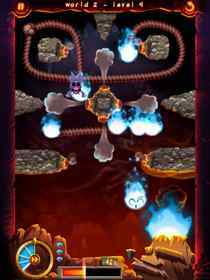 And getting all of them can be quite tricky, because you will not only have to figure out the right order to light the ropes up, but you will also need to be navigate the lava rock super fast and precise around the screen. 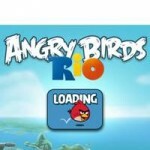 But despite that, the levels never become really difficult. The game does offer a pretty clever twist in world 3, but while it’s a clever idea, it isn’t all that challenging. The most difficult levels are the ones where you need to avoid water drops, so more of them would have been welcome. It’s not necessarily a bad thing though, but with the levels being completed that fast, it would have been nice to see some more content. However, new levels are already announced via future updates, something I’m definitely looking forward to. 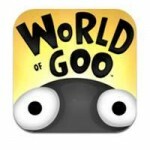 Despite these little shortcomings, Burn it All is a very fun and polished game and comes as universal app for $0.99.